The UK may refuse to exit from the EU if the parties fail to agree on Brexit. Will the British pound rise? Foreign Secretary Jeremy Hunt said that the UK might remain in the European Union. Brexit was scheduled to take place on March 29, 2019. On January 15, a vote will be held in the British Parliament and during the vote, the plan of Prime Minister Theresa May on the terms of the country’s withdrawal from the European Union is to be approved. Data on inflation for December, which may also affect the dynamics of the pound will be published on January 16 in the UK. On the daily timeframe, GBPUSD: D1 is in a downtrend, but the decline has slowed down and a number of technical analysis indicators have formed buy signals. The further price increase is possible in case of the transfer of Brexit and publication of positive macroeconomic indicators in the UK. The Bollinger bands have narrowed, which indicates low volatility. The RSI indicator is above 50. It has formed a double positive divergence. The bullish momentum may develop in case GBPUSD exceeds the upper Bollinger band at 1.284. This level may serve as an entry point. The initial stop loss may be placed below the last fractal low, the low since April 2017, the lower Bollinger band and the Parabolic signal at 1.24. After opening the pending order, we shall move the stop to the next fractal low following the Bollinger and Parabolic signals. Thus, we are changing the potential profit/loss to the breakeven point. More risk-averse traders may switch to the 4-hour chart after the trade and place there a stop loss moving it in the direction of the trade. If the price meets the stop level (1.24) without reaching the order (1.284), we recommend to close the position: the market sustains internal changes that were not taken into account. The major currency pair retreated last Friday and this decline continues today, January 14. So far, EURUSD investors are analyzing the news and macroeconomic reports and trying to escape risks. It supports the USD and puts pressure on stock indexes. At the same time, investors barely paid any attention to the CPI report published by the USA last week. According to the report, the inflation lost 0.1% m/m in December, just as expected. By the way, in November the indicator did not change. It is the lowest CPI value since March 2018. On YoY, the indicator was 1.9% in December after being 2.2% the month before. It is interesting that the Core CPI expanded by 0.2% m/m at the end of 2018. Talking about investors trying to escape risks, everything remains the same: duration of the Government Shutdown in the USA reached stratospheric levels. Several agencies haven’t been operating for almost 24 days. The Congress still hasn’t agreed on financing the Mexican issue, that’s why policymakers can’t get back to work: they are on unpaid leave and this is rather negative signal. As long as the American Government doesn’t restore its routine operations, the USD will have a chance to recover and get stronger. From the technical point of view, EURUSD is trading inside a mid-term ascending correctional channel. Currently, the pair has rebounded from the mid-term resistance line and right now is forming a short-term downtrend. 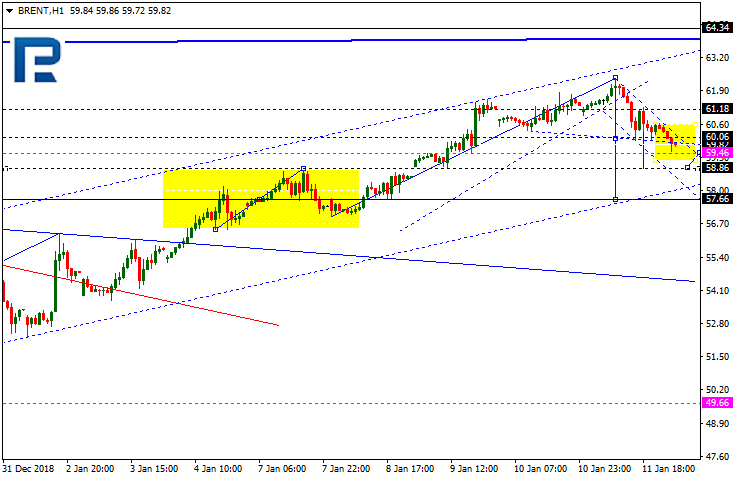 In the H1 chart, one can see that the price is testing the downside border of the current channel. If the pair breaks the support line at 1.1453, the instrument may continue falling towards the projected support line at 1.1350. Another possible scenario implies that the price may complete the current downtrend and resume trading upwards to reach the resistance line at 1.1510. If the pair breaks the local resistance level, the instrument may start a new impulse inside the mid-term correctional trend with the closest target at 1.1560. EURUSD has rebounded from 1.1537 and reached the predicted downside target at 1.1461; right now, it is consolidating above the latter level. Today, the pair may move downwards to reach 1.1440. Later, the market may grow to return to 1.1461 and then form a new descending structure with the target at 1.1386. This structure may be considered as the third descending wave. GBPUSD is still consolidating above 1.2758. Possibly, today the pair may fall to reach 1.2787 and then grow towards 1.2825. After that, the instrument may continue consolidating and form a new descending structure with the target at 1.2725. USDCHF is consolidating at the top. Today, the pair may reach 0.9862 and then fall towards 0.9791. Later, the market may form one more ascending structure to return to 0.9862, break it, and then continue growing with the target at 0.9920. 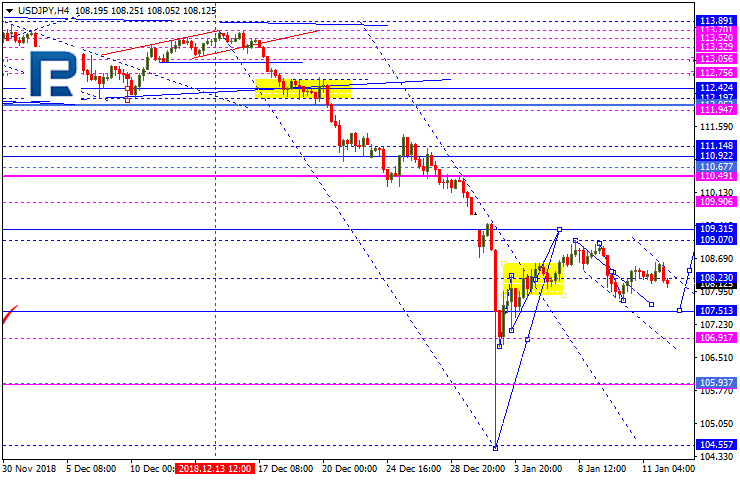 USDJPY is trading downwards to reach 107.51. After that, the instrument may start a new growth towards 109.31 and then form a new descending structure to return to 107.51, break it, and then continue trading inside the downtrend with the target at 105.95. AUDUSD has completed the descending impulse along with the correction; right now, it is forming the second descending impulse with the target at 0.7129. 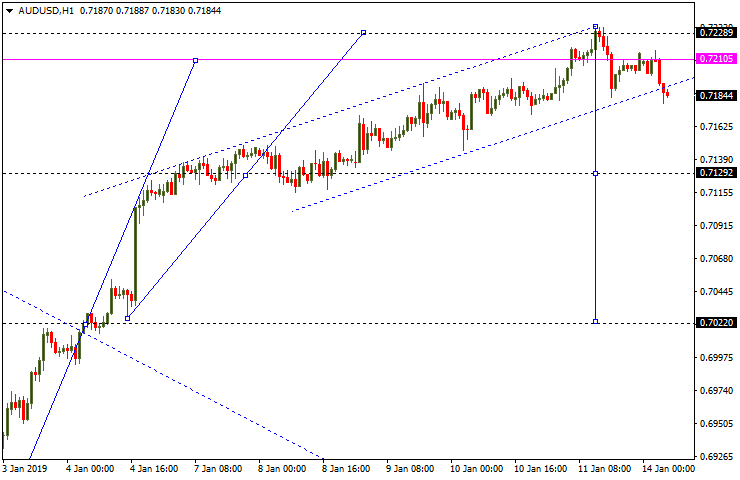 Later, the market may resume growing towards 0.7186 and then start a new decline to reach 0.7022. USDRUB is still trading around 66.98. Possibly, today the pair may expand the range towards 67.32. 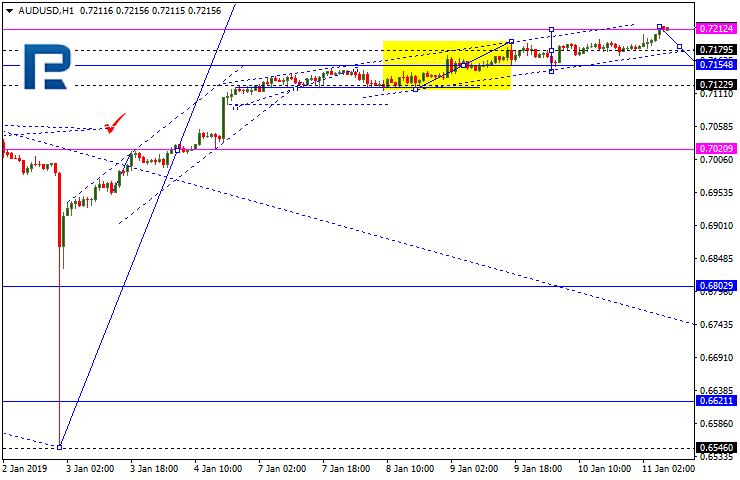 After that, the instrument may resume falling to reach 66.50 and then start a new correction with the target at 68.13. Gold is still consolidating at the top. 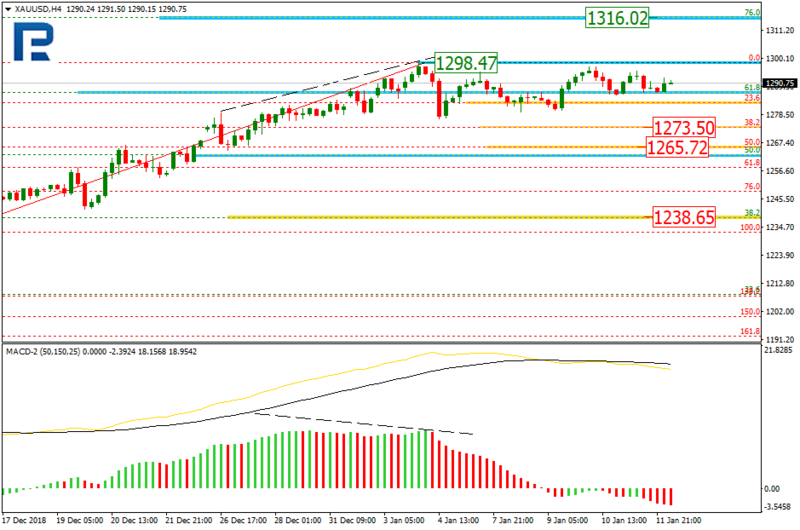 Possibly, the pair may expand the range towards 1297.60 and then resume falling to reach 1282.22. Later, the market may form one more ascending structure to reach 1300.00 and then start a new decline with the target at 1276.50. Brent has finished the first descending impulse along with the correction; right now, it is forming the second impulse with the target at 58.86. After that, the instrument may reach 60.06 and then form a new descending structure towards 57.66. Later, the market may resume growing with the target at 64.34. Sterling entered the trading week firmly gripped by caution as investors brace for a vote tomorrow on British Prime Minister May’s Brexit deal. Although market expectations remain elevated over May’s Brexit deal facing rejection by Members of Parliament, there will be a stronger focus on what happens after the “meaningful vote”. Will the government’s defeat on May’s deal result in Labour triggering a no-confidence vote? Will Theresa May rush back to Brussels to plead for further concessions from the EU? Amid the chaos and uncertainty, could the UK government be forced to extend Article 50 beyond the planned exit date? Are we going to witness a snap general election or even a second Brexit referendum? While the outcome of tomorrow’s Brexit vote remains open to question, it will certainly leave a lasting mark on the British Pound. Theresa May is scheduled to make a statement to Parliament this afternoon in a bid to gather more support for her deal. Her speech runs of the risk of falling on deaf ears if nothing new is brought to the table. Sterling’s outlook remains mired by endless uncertainty surrounding Brexit and ongoing political drama in the House of Commons. The volatile price action witnessed in recent days continues to highlight how the currency remains influenced by Brexit headlines. In regards to the technical perspective, the GBPUSD secured a weekly close above 1.2820, mostly due to Brexit noise. The 1.2820 level is seen acting as support that pushes prices towards 1.2920. Although the technicals are pointing to further upside in the near term, investors should keep in mind that the Pound’s fate hangs on what happens after the Brexit “meaningful vote” on Tuesday. Are Dollar bulls running out of steam? Dollar Index bulls have been missing in action in recent weeks with the breakdown below 96.00 suggesting that bears are back in the driver’s seat. Appetite towards the Dollar is seen diminishing further if disappointing economic data threatens it’s safe-haven status. With the economic calendar in the United States void of Tier 1 economic reports today, the Dollar is poised to be driven by price action. Technical traders will continue observing how prices behave below 96.00. Sustained weakness under this level could open a path back towards 95.00 and 94.20, respectively. Gold not only remains supported by geopolitical risks but expectations over the Fed taking a break on rate hikes this year. The yellow metal continues to shine brightly amid the uncertainty with weakness in both global equity markets and the Dollar fueling upside gains. Taking a look at the technical picture, Gold remains firmly bullish on the daily charts as there have been consistently higher highs and higher lows. A solid breakout and daily close above the psychological $1,300 level is seen opening a clean path towards $1,308 and $1,324. 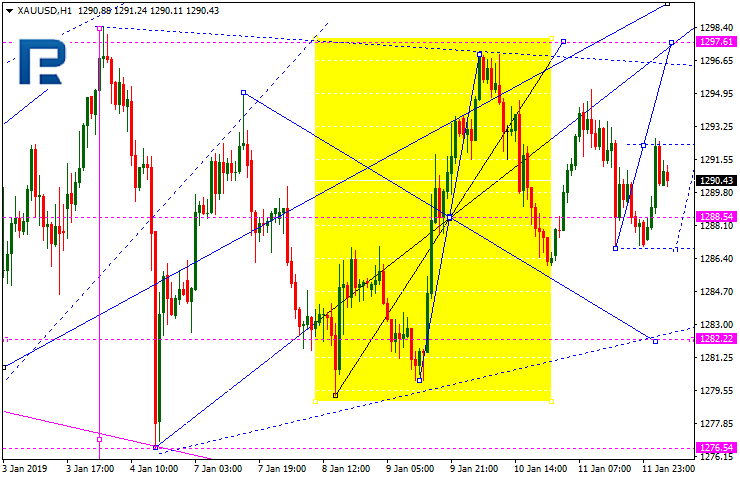 As we can see in the H4 chart, XAUUSD is being corrected sideways and may break the range both upwards and downwards. 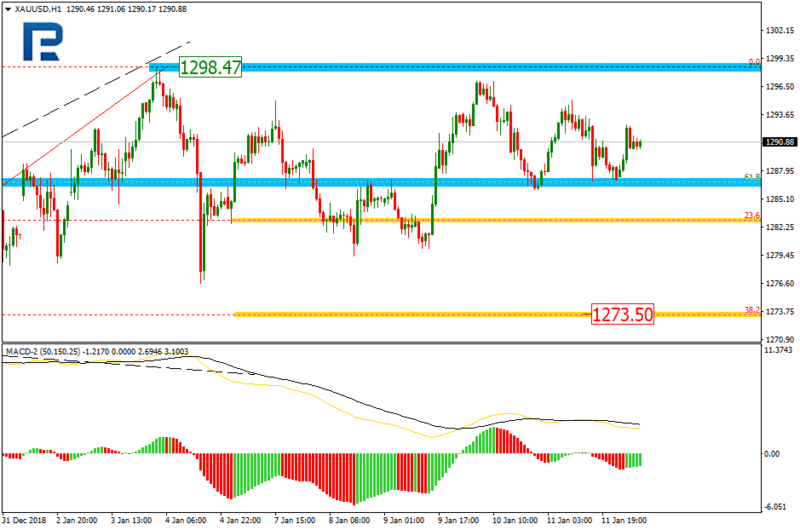 By now, the pair has been corrected to the downside by 23.6% and may continue trading towards the retracements of 38.2 and 50.0% at 1273.50 and 1265.72 respectively. However, if the price breaks the high at 1298.74, the instrument may resume growing to reach its mid-term target at 1316.02 (the retracement of 76.0%). The support level is at 1238.65. In the H1 chart, the pair is consolidate inside the convergent triangle range. In this case, there is a high possibility that the price may break the range to the upside. 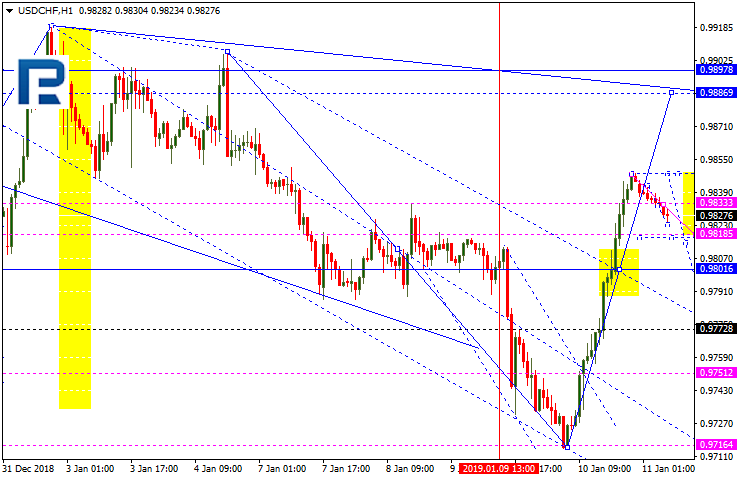 As we can see in the H4 chart, the correctional downtrend continues; USDCHF has already reached the retracement of 61.8%. At the same, time, there was a huge convergence on MACD, which may indicate a new impulse to the upside. 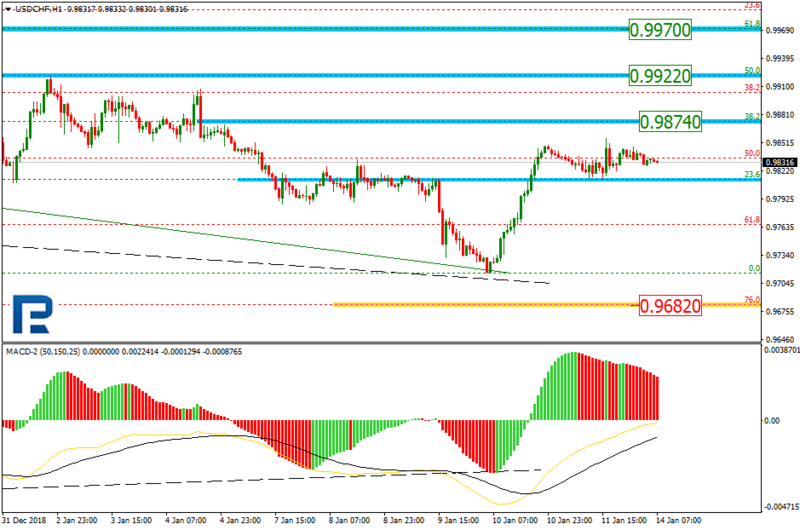 The possible targets are the retracements of 38.2%, 50.0%, 61.8%, and 76.0% at 0.9874, 0.9922, 0.9977, and 1.0029 respectively. The key resistance level is the high at 1.0128. 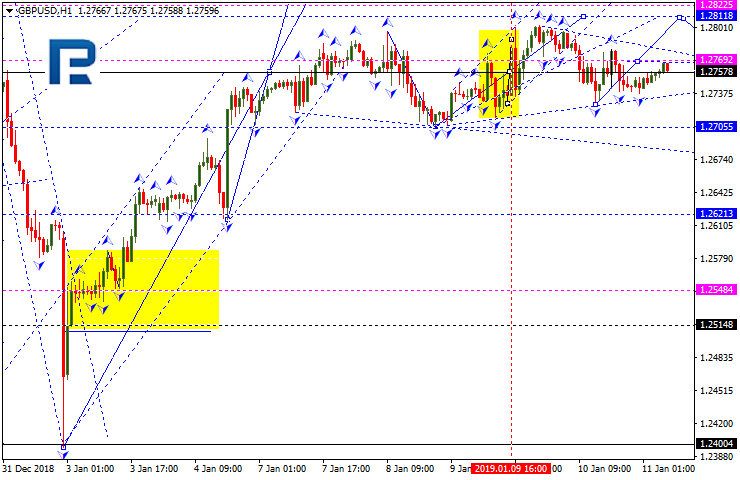 In the H1 chart, the pair has reached the retracement of 23.6% and right now is trading sideways. On Friday the EUR/USD currency pair was in a bearish mood. The quotes lowered by more than 80 points. Important economic reports from the US were published, which have proven true the investors` expectations. For example, the basis consumer price index was 0.2% which fit the experts` expectations. Right now the trading instrument is consolidating in the 1.14500-1.14900 range, you should open positions from these levels. – Report on the Volume of Industrial Production in EU – 12:00 (GMT+2:00). The indicators do not provide precise signals. The price is being traded between 50 MA and 200 MA. The Stochastic Oscillator is in the negative zone but above the signal line which gives a weak signal to sell EUR/USD. If the price fixes below the local support level of 1.14500, consider selling EUR/USD. The movement will tend toward 1.14100-1.13700. Alternatively the currency pair can grow toward 1.15400-1.15600. 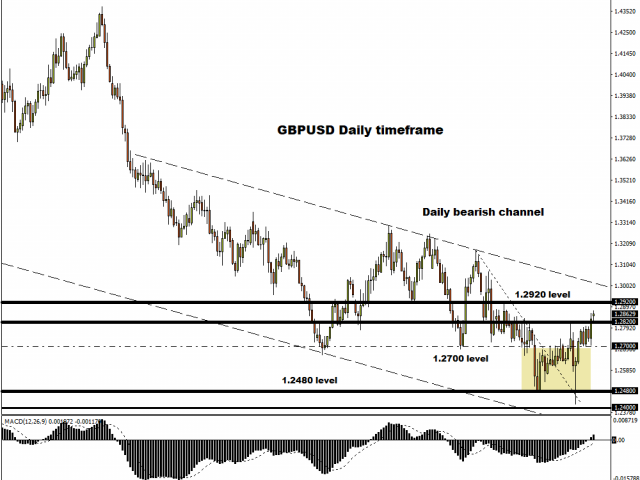 On Friday GBP/USD saw an aggressive buy-out after the publication of weak economic reports. The GDP (m/m) grew by 0.2% instead of 0.1%. The production volume in the processing industry lowered by 0.3% instead of growing by 0.4% as expected. The monthly GDP (3m/3m) grew by 0.3% which fits with the investors` expectations. The quotes grew by 100 points. Right now the key support and resistance levels are 1.28000 and 1.28600 respectively. You should open positions from these levels but expect a technical correction soon. The Economic News Feed for 14.01.2019 is calm. The indicators point toward the power of the buyers, the price fixed above 50 MA and 200 MA. The MACD histogram is in the positive zone but below the signal line which gives a weak signal to buy GBP/USD. The Stochastic Oscillator is in the neutral zone, the %K line is crossing the %D line. There are no precise signals. If the price fixes below the round 1.28000 expect a technical correction of GBP/USD quotes toward 1.27500-1.27000. Alternatively the currency pair grow toward 1.29000-1.29200. On Friday USD/CAD had shown a bullish mood. The trading instrument is moving sideways. The key support and resistance levels are 1.32500 and 1.33000 respectively. Positions should be opened from the key levels, expect further growth. The price fixed between 50 MA and 200 MA which act as the dynamic levels of support and resistance. The MACD histogram is in the positive zone but below the signal line which gives a weak signal to buy USD/CAD. The Stochastic Oscillator is in the neutral zone, the %K line is below the %D line which gives a weak signal to sell USD/CAD. If the price fixes above the round 1.33000 expect the quotes to grow toward 1.33400-1.33600. Alternatively the currency pair can descend toward 1.32000-1.31700. The USD/JPY quotes are still showing an ambiguous technical picture. The quotes are consolidating around the 108.000-108.500 range. Investors are waiting for additional drivers. You should open the positions from the key levels. The price fixed below 50 MA and 200 MA which indicates a bearish mood. The MACD histogram is close to 0, there are no signals. The Stochastic Oscillator is in the neutral zone, the %K line is above the %D line which gives a signal to buy USD/JPY. If the price fixes below the round 108.000 expect thequotes to descend toward 107.500-107.200. Alternatively the quotes can grow toward 109.000-109.250. USDCHF sees price halt with recovery risk expected in the new week. This leaves resistance residing at the 0.9850 level as the next upside target. 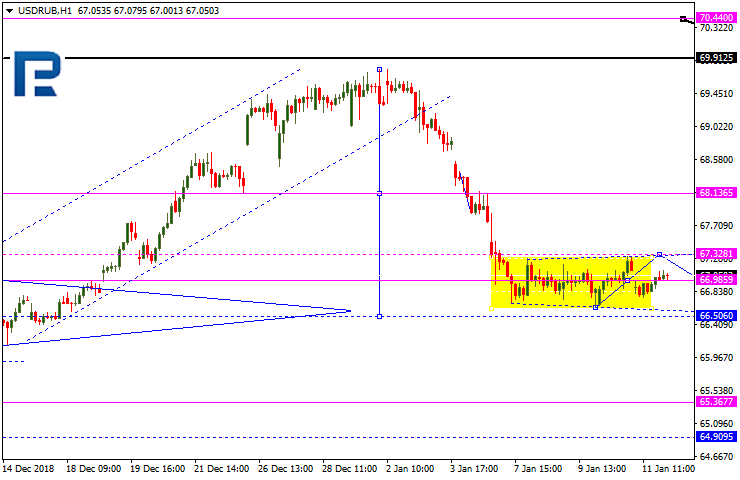 A break of here will clear the way for more gain towards the 0.9900 level. 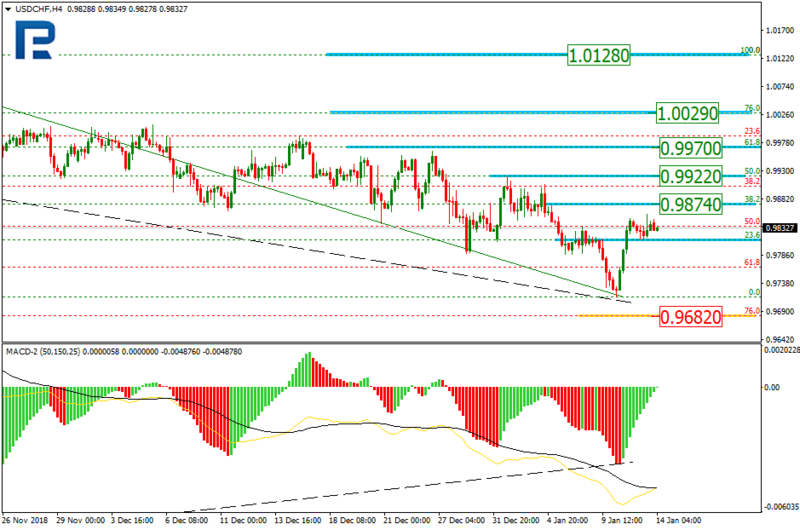 Above here, resistance comes in at the 0.9950 level and then the 1.0000 level. On the downside, support is seen at the 0.9800 level. A turn below there will set the stage for more decline towards the 0.9750 level. And then the 0.9700 level. All in all, USDCHF faces further upside threats on a possible corrective recovery higher. EURUSD backs off higher prices with eyes on 1.1421 zone in the new week. 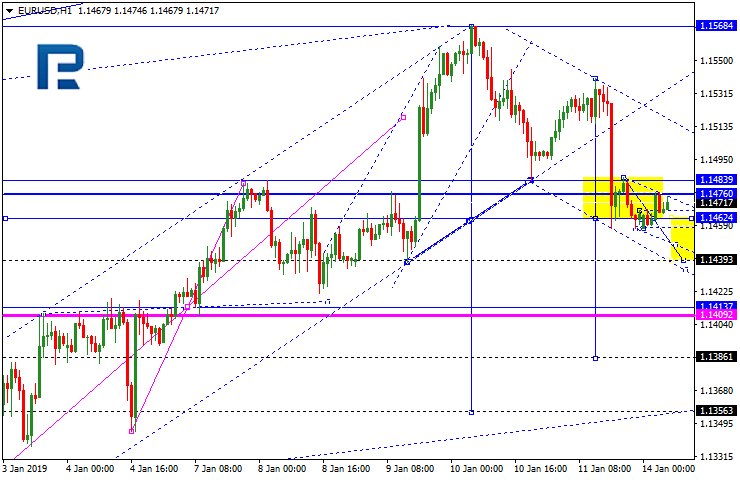 Support comes in at the 1.1450 where a violation will aim at the 1.1400 level. 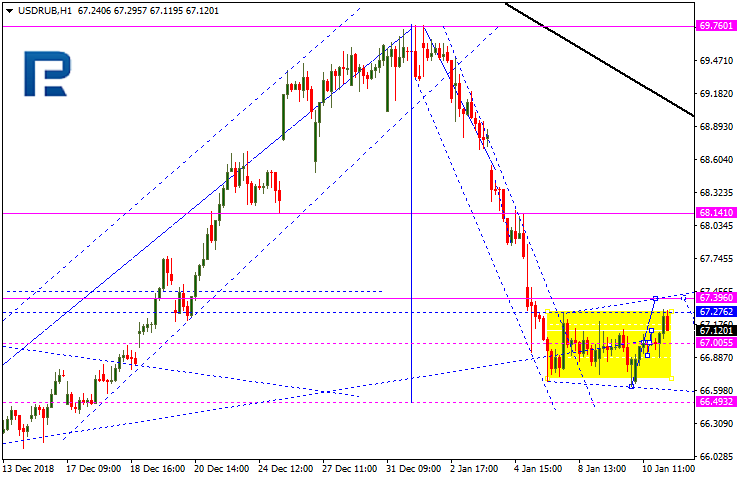 A break below here will target the 1.1350 level. Further down, support lies at the 1.1300. On the upside, resistance resides at 1.1500 level with a break through there opening the door for further upside towards the 1.1550 level. Further up, resistance comes in at the 1.1600 level where a violation will expose the 1.1650 level. All in all, EURUSD continues to threaten further downside pressure on price rejection. EURUSD has reached its downside target; right now, it is trading upwards to reach a.1537. Later, the market may fall towards 1.1510, thus forming a new consolidation range between two above-mentioned levels. If the instrument breaks this range to the upside, the price may form one more ascending structure with the target at 1.1570; if to the downside – resume falling towards 1.1461. GBPUSD is still consolidating above 1.2758. Possibly, today the pair may grow towards 1.2811 and then fall to return to 1.2758, thus forming a new consolidation range. If the instrument breaks this range to the upside, the price may continue growing to reach 1.2899; if to the downside – form a new descending structure with the target at 1.2700. USDCHF is falling towards 0.9815. Later, the market may start a new ascending wave to reach 0.9833, thus forming a new consolidation range. If the instrument breaks this range to the upside, the price may continue growing with the target at 0.9888; if to the downside – form a new descending structure towards 0.9800. USDJPY is trading upwards to reach 108.63. After that, the instrument may start a new decline with the target at 107.70. 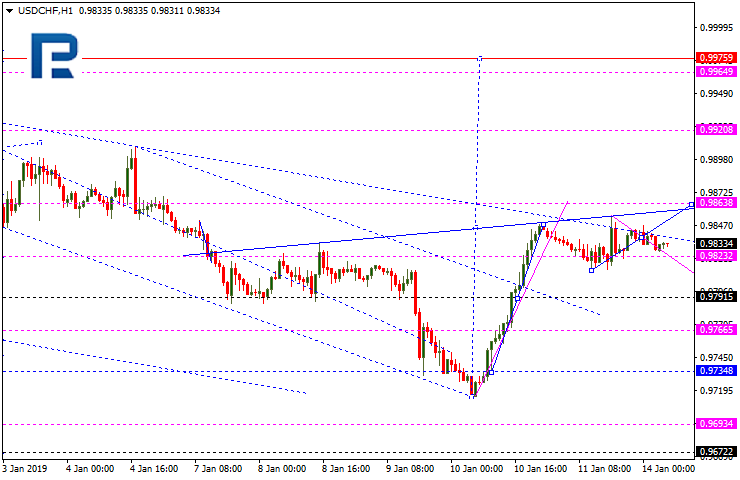 AUDUSD has completed the ascending wave. Today, the pair may fall to break 0.7155. After that, the instrument may continue the correction with the target at 0.7122. USDRUB is trading upwards to reach 67.37. Later, the market may resume falling towards 67.00, thus forming a new consolidation range. If the instrument breaks this range to the upside, the price may be corrected with the target at 68.15; if to the downside – continue trading inside the downtrend towards 66.50. Gold is trading upwards. Possibly, the pair may reach 1297.90. After that, the instrument may fall towards 1291.44 and then form one more ascending structure to reach 1300.955. 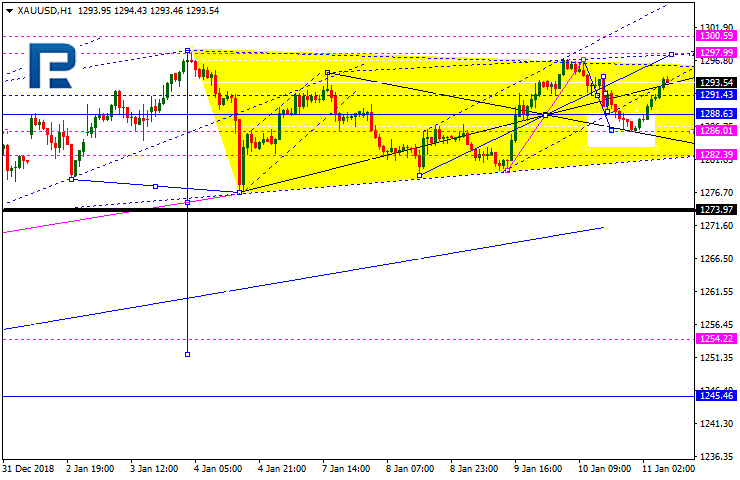 Later, the market may form a new consolidation range around 1288.63. 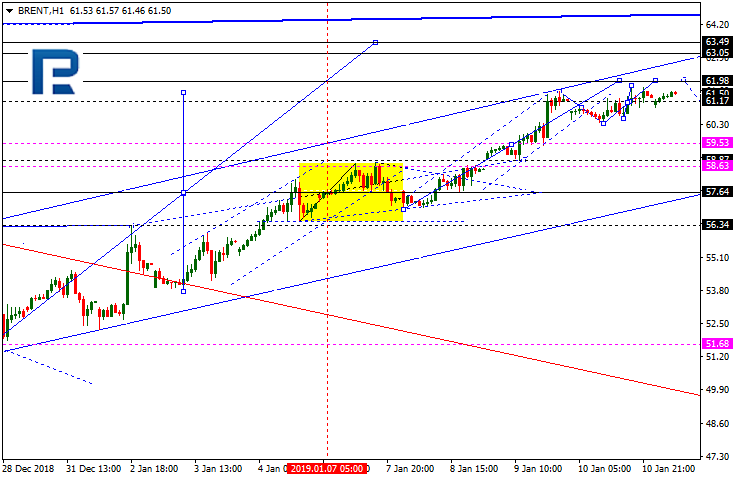 Brent is consolidating around 61.17. Today, the pair may reach 61.98. After that, the instrument may form a new descending structure towards 59.55 and then resume with the short-term target at 63.05. EUR retreated from the local maximums. Yesterday the quotes fell by 40 points. 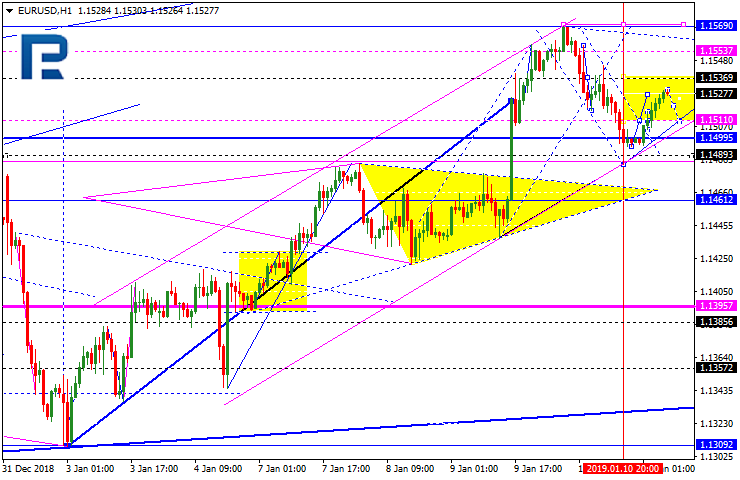 Right now they are consolidating around 1.15100-1.15350, you should open positions from these levels. USD remains under pressure, since some representatives of the Federal Reserve do not want to increase the key interest rate in 2019. Today the attention will be on the US inflation report. Positions should be opened from the key levels. The Stochastic Oscillator is in the neutral zone, the %K line is below the %D line, which points toward a bearish mood. If the price fixes above 1.15350 expect growth toward 1.15700-1.16000. Alternatively the quotes can correct toward 1.14850-1.14500. GBP/USD remains in a long flat. There is no single well-defined trend. Right now the quotes are testing the local support and resistance levels of 1.27100 and 1.27650. The pound has a tendency to descend. The investors are waiting for important reports from the UK. Positions should be opened from the key levels. The indicators do not provide precise signals, the price has fixed between 50 MA and 200 MA. The MACD histogram started to descend, which points toward a bearish mood. The Stochastic Oscillator is in the neutral zone, the %K line is below the %D line, which points toward the sale of GBP/USD. If the price fixes below the local support 1.27100 expect the quotes to dall toward 1.26600-1.26400. Alternatively the quotes can grow toward 1.27750-1.28000. The USD/CAD keeps showing a negative trend. 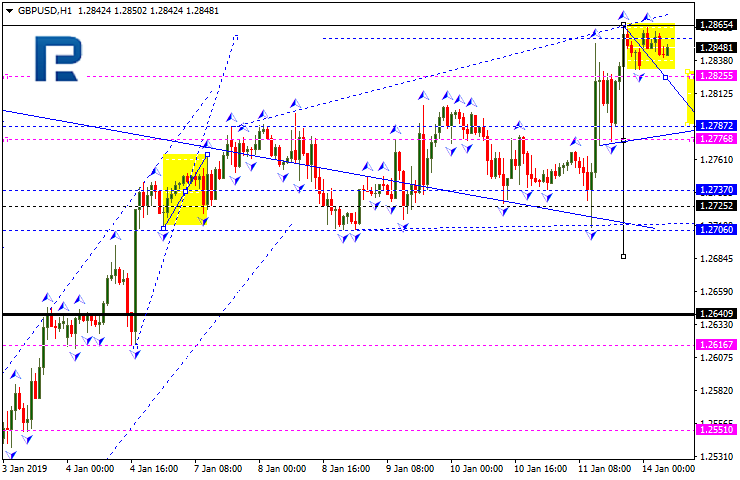 At the moment CAD is testing the local support of 1.31800. 1.32200 is a mirror resistance. The demand for the USD is weakened after the FOMC minutes. The CAD is supported by the bullish mood on the oil quotes. USD/CAD can descend further, positions should be opened from the key levels. The Economic News Feed for 11.01.2019 is calm. The price fixed below 50 MA and 200 MA, which points toward the power of the sellers. The MACD histogram is in the negative zone and below the signal line, which points to a descend of the USD/CAD quotes. The Stochastic Oscillator is in the oversold zone, the %K line is below the %D line which gives a weak signal to sell USD/CAD. If the price fixes below the local support 1.31800 expect the quotes to descend toward 1.31500-1.31200. Alternatively the quotes can correct toward 1.32500-1.33000. 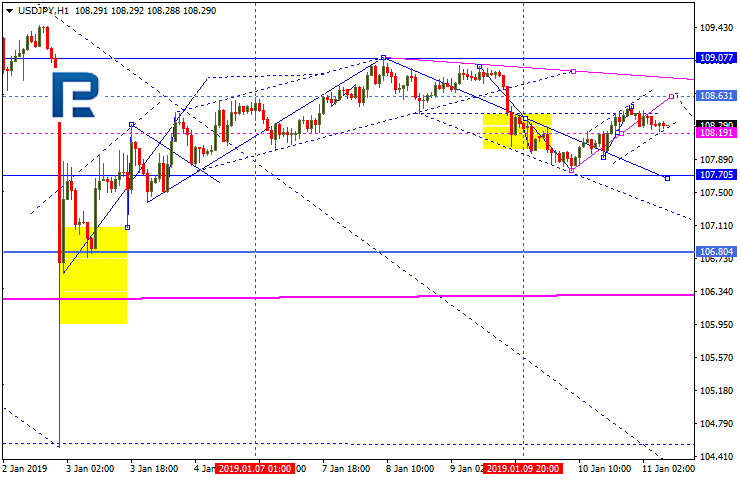 The USD/JPY is showing an ambiguous technical picture. Right now the quotes are consolidating around 108.000-108.500 and can descend further. Keep an eye on the US News Feed. You should open positions from the key levels. If the price fixes below the round 108.000, expect the quotes to descend toward 107.500-107.200. Alternatively the quotes can recover toward 109.000-109.250.